Tap (Brew By Numbers Brewery, London). Dark amber color. Small size, off-white head, stays. Super fruity, citrus and some band-aid in aroma. Rubbery, fruity and citrus in taste. Band aid in aftertaste. Drinkable brew. Bottle from Park Fever, Hither Green. Amber pour with a white head. Melon, light toffee and bitter citrus aroma. Flavours of grapefruit, lemon, spot of lime, tangerine. Nice bitterness in the finish. Bottle from Cotteridge Wines; hazy dark amber pour with a thin off white head, aroma has slight marzipan and sweet red fruits, taste has hint of caramel, some fruits, light citrus, some spice, first golde in months. 17Mar2018 Floral hops, bitter straw and grass, bitter grain, light bitter citrus fruits, lemon peel. Hazy, dark gold, massive, frothy, off-white head. Light bitter. More floral notes, bitter straw, bitter citrus fruits, lemon and orange peel, some grass, soft carbonation, medium bodied. Alright, nothing too spectacular. Bottle from Offie & Toffie, Bethnal Green. 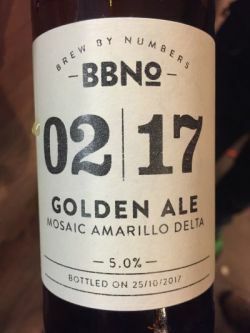 [email protected] By Numbers Tap, Bermondsey, London - Golden Amber pour with white head and lacing. Fruiry and sweet bready malty notes, some citrus fruity hits, notes of grapefruit and tangerine, medium bodied, fruity hoppy finish. From tap. Pours hazy orange. Small white head. Aroma is grapefruity and slight toasted. Smooth fruity. Crisp hoppy. Mellow. Lingering hoppy. Bitter and smooth fruity. Dry. Solid hoppy finish. Hazy gold beer, small pale cream colour head. Smooth palate, semi dry, decent fine minerally carbonation. Light malts, sweet. Mild nibbly hop spice. A little bitter floralness. Mild ripe citrus. Mild pine. Smooth spicy finish. Pretty good, a robust gold.